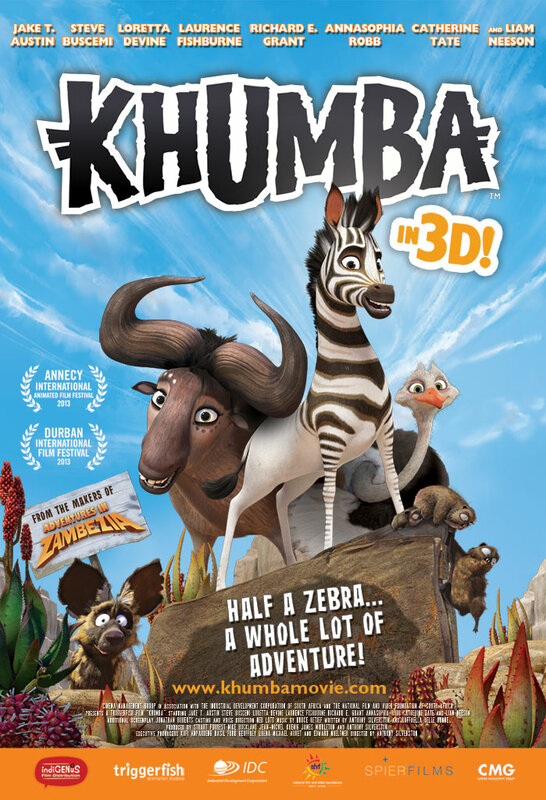 When little Khumba (Jake T. Austin) is born with only half his stripes, he is ostracised by all the zebras in the herd except for his loving mother Tombi (AnnaSophia Robb) and father Seko (Laurence Fishburn). Ridiculed by all, Khumba is also blamed by the superstitious herd for the drought that is ravishing the land. A chance meeting with a mystical mantis leads Khumba on an epic journey to find the legendary waterhole in which the first zebras bathed and came out striped. Alone in the wilderness, Khumba has a close shave with an opportunistic Wild Dog (Steve Buscemi) and joins forces with a hefty, overprotective wildebeest called Mama V (Loretta Devine) and an insecure but flamboyant ostrich called Bradley (Richard E. Grant). Together they encounter a migrating herd of Springbok; a bohemian community living safely within the confines of a luxurious national park; an endangered riverine rabbit who’s determination to survive has clearly gone to his head; a doomsday cult of dassies (rock-rabbits) and a loony, solitary sheep (Catherine Tate) living on an abandoned farm. Every step of the way the trio is stalked by the tyrannical leopard, Phango (Liam Neeson) who believes the myth that the half-striped zebra will make him the most powerful hunter that ever lived. In a hair-raising, epic battle Khumba succeeds in defeating Phango and ultimately earns his stripes.